Shigehiro Yamaguchi and a team of scientists from Nagoya University have created a molecule which when hit with 365 nm ultraviolet light will emit various colors of light depending on its environment. The basic design of the molecule consists of a flexible π moiety and two rigid wings. The flexibility and rigidity combined in this molecule’s skeleton is what makes this system so remarkable. There are two characteristics of this system which makes it outstanding. First is the ability to change from nonplanar V-shape to a planar form in excited state, allowing for dual fluorescence. 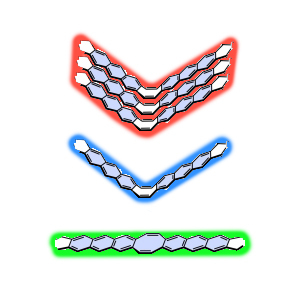 Secondly the nesting ability of the V-shaped molecules is unique and provides the necessary structure to emit the third color. In a basic sense the molecule will maintain one of three forms, the V-shape, flat, or stacked V-shape. The form the molecule takes depends entirely on its environment. It will bend into the V-shape and emit a blue light when trapped in a polymer, lie flat and glow green when dissolved in organic solvent, and stack multi-layers and emit a red hue when crystalized. Temperature and pressure also affect the molecule’s change in shape and so the colors can serve to identify many aspects of their environment. This bio-molecule invention is so unique that it may be used as the groundwork strategy for future molecular sensors.